Keep a 45-gallon temperate seagrass lagoon biotope seahorse tank between 65 and 68°Fahrenheit. The tank won’t have corals, or even photosynthetic gorgonians or anemones, but because I’ll be keeping abundant macroalgae and seagrass in the display tank, it is necessary to provide strong lighting. Naturally, the stronger the lighting (in this case, 350 watts of metal halide and 130 watts of PC), the harder it will be to maintain the target temperature range. Why not just keep tropical seahorses? Because of that evil publication, Coral Magazine. Remember the first issue with those adorable seahorses on the front cover? Yeah.Hippocampus breviceps. I decided then that I needed them, and have been working towards creating the best home I can for them ever since. So, it’s all Coral Magazine’s fault. Breviceps can handle a range of temperatures much lower and even do okay in the low seventies. I would like to observe how changes in temperature and photoperiod effect their mating and breeding behavior, so being able to maintain specific temperature ranges is important. I need temps cool and carefully controlled, too. I figure accuracy of one or two degrees should be fine. Oh, and the tank is situated in my living room, where we watch TV. So excessive heat and noise is not an option. And I’m not wealthy. Acquiring a chiller for most people is costly enough, but with energy prices as high as they are, the expense of running a chiller is also a big consideration. Choosing a chiller based on initial cost is not always the best way to save money in the long run, nor is getting the smallest possible model for your needs. In fact, choosing a chiller that is designed for efficiency, and choosing the best size/rating for your needs is key to saving money. And I’m not especially handy, technology-wise. Okay, I’m pretty hopeless. So, I need something easy to use and maintain. Efficiency, accuracy, quiet operation, ease of use. That’s what I need in a chiller. It’s a lot to ask. Lighting: Custom Sealife 36″ custom hood, 2 65-watt PC actinics, 2 175-watt 15,000k MH (fan is currently not working on hood). This system was designed as a planted marine seagrass biotope, with live sand and rock, macroalgae, and vascular marine plants as the main filtration. After the tank is well established, I can add a canister filter or CPR hang-on skimmer in the sump to maintain water quality. Since this is a seahorse species-specific system, I need to keep the flow fairly low (relative to reef tanks) and the zooplankton population high. Although the horses will be tank bred and eating frozen mysis, I believe you can’t have enough variety in a seahorse’s diet, and pods certainly will add diversity to their diet. Luckily, macros and grasses in the display tank and a sump/refugium seeded with pods should provide a steady supply of zooplankton to supplement the horse’s enriched mysis meals. I spoke to Mike Noce of Fritz Industries, the distributer of Teco products in the United States, and we decided that the best chiller for this system was the T20 because of the fact that the animals need temperate water conditions year round. For a tropical system, I could have used the T15 or even the T10, but as you’ll see, the one-third horsepower unit is really the best choice for efficiency and reliability, long-term, for my cool water system. Fritz Industries provided me with the unit, and, since the manual hadn’t been printed yet, I downloaded a PDF from their Web site, www.TecoUS.com. That manual can be downloaded by right clicking the following link and choosing “Save link as” or “Download linked file”: Teco SeaChill Manual. The small spec sheet that came with the unit had some entertaining Engrish, but the manual itself was easy to understand and had clear diagrams and images. 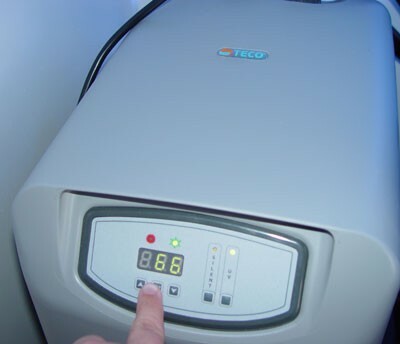 Teco SeaChill chillers are available with either an integrated heater or UV sterilizer option. I chose the UV sterilizer. The heater, were I to have chosen that option, would be controlled by the automatic thermostat. You may notice from the specs above that I chose a more powerful chiller than my system needs. 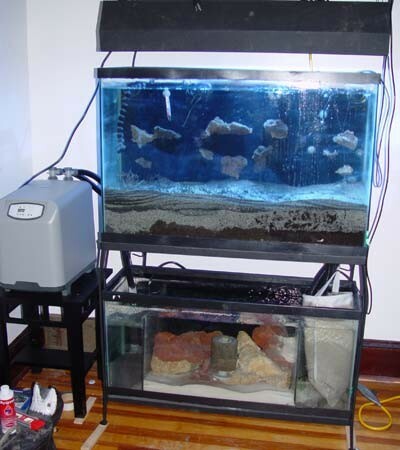 After all, once you take into account that I have a 7″ sand bed and a sump full of rock, my “75-gallon” system is only circulating about 45 gallons of water. For a 15° pull-down, the SeaChill T20 is rated for more than 300 gallons. However, the more powerful the chiller unit, the less it will actually be operating. 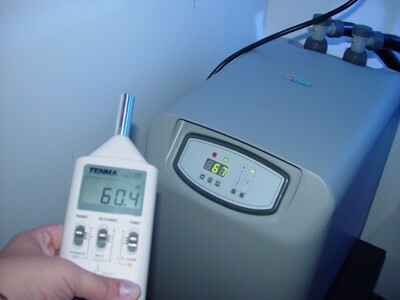 In the table below, you’ll see that after the initial cool-down of the tank water from 78° to 67°, the unit only cycles on for fifteen minutes every two hours. A less powerful unit would be running longer and more often, thus creating more noise, using more energy and causing more wear on the unit. 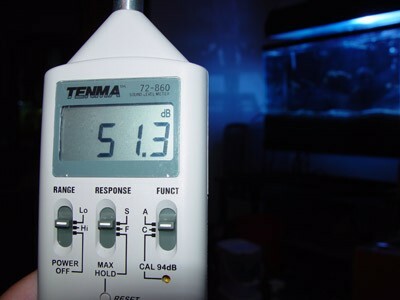 Note: These temperatures were taken while the tank lights were on, and the optional integrated UV sterilizer was running. I started out with a water temperature of 79°. Setting the desired temperature was really simple. Once you’ve turned on the power, press the “set” button once, then use the arrow buttons to raise or lower the temperature on the display. I originally set the chiller to 66°, then pressed “set” again, and it was good to go. Within two hours, the water temperature dropped twelve degrees. You’ll also noticed the ambient temperature also rose during this time. How much of this was due to the chiller throwing off heat or to the time of day, it’s hard to say. But it really wasn’t as much as I expected. The LED display never reached 66°, as you can see from the chart above. The thermometer I used in the tank was hard to read, but seemed to measure approximated the same as the T20 display was showing. I’ll have to get a digital thermometer and check the numbers again. 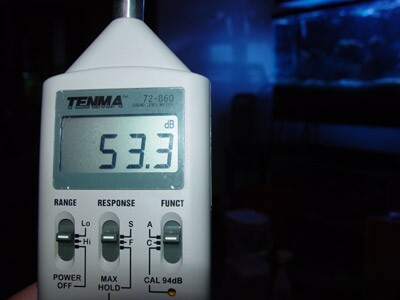 I also noticed that the water temperature rose to 68° and remained there for some time before the chiller cycled back on. Since the accuracy was within the range I was comfortable with, I don’t see that as a problem. The temperature never went higher than two degrees over what I set the chiller to maintain. Teco U.S. provides specs for this chiller that indicate operating noise levels of 41 decibels (dB) in normal mode and 39 dB in “Silent mode,” a handy feature for when we’re watching a movie and don’t want background noise interfering. I used a sound meter to take the following measurements, beginning with the normal operating noise of the system with only the lights, air pump and Magdrive 9.5 running. Also, there is a central air conditioning vent in the room. This gave me a baseline ambient noise reading of 47.9 dB right next to the tank, and 46.7 dB about 7 feet away, on the couch. 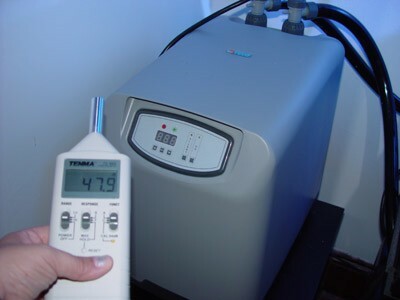 Next, I switched on the T20 chiller and took readings again. Close to the tank, the noise level only increased by 12.8 dB, well under what I expected. Over by the couch, the increase was only 6.6 dB. 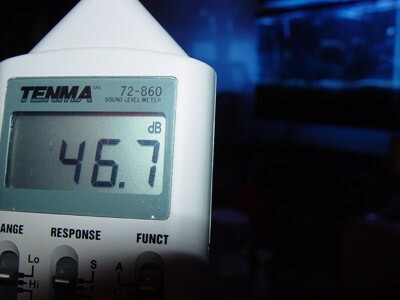 In Silent mode, as you an see, the increase was only 8.9 dB from the ambient noise level near the tank and 4.6 decibels from the couch! This chiller is extremely quiet, especially considering how powerful it is. 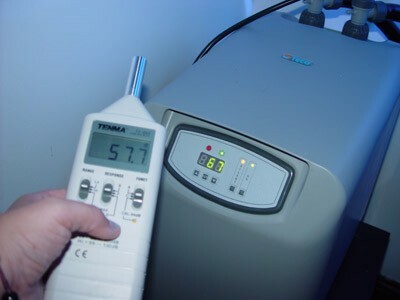 Ambient noise (chiller off) less than one foot from the chiller was 47.9 decibels. Ambient noise (chiller off) about 7 feet from the chiller was 47.9 decibels. In normal mode, less than one foot from chiller. Normal mode, 7 feet from chiller. Silent mode, less than a foot from the chiller. And back at the couch, chiller in silent mode. I managed to hook up the input and output hoses without a problem. I figured out how to set the controls and use the UV sterilizer, and set the chiller to “Silent Mode.” I even found the filter all by myself! I didn’t need any tools or adhesives or adapters. 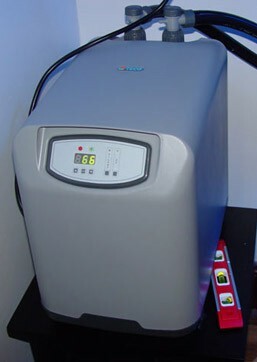 Installing this chiller was the easiest and ONLY mistake-free aspect of setting up this system. The most important thing that I did have to consult the manual for is that you have to leave enough ventilation space behind the unit so it will operate efficiently. Luckily, I had figured on giving it a place of pride in my living room, and hadn’t expected to stow it in a small cabinet, so providing the 8″ of clearance space was no problem. Even I could handle setting the temperature. The manual provides very clear instructions and photographs for cleaning the air filter and changing the UV bulb (every 12 months). There doesn’t seem to be a need to periodically “back wash” the coils, which is great, because I have no idea what that means. It’s just something that someone asked me to check the manual for, so there you go. I’m thrilled. Tickled. Delighted. Anyone who knows me had been hearing about this breviceps system for at least two years. Selecting and acquiring the chiller was the final step I had to make in my preparations. I’m certain I made the perfect choice a chiller. And with a 2-year manufacturer’s warranty, I feel even more confident about choosing the Teco SeaChill.